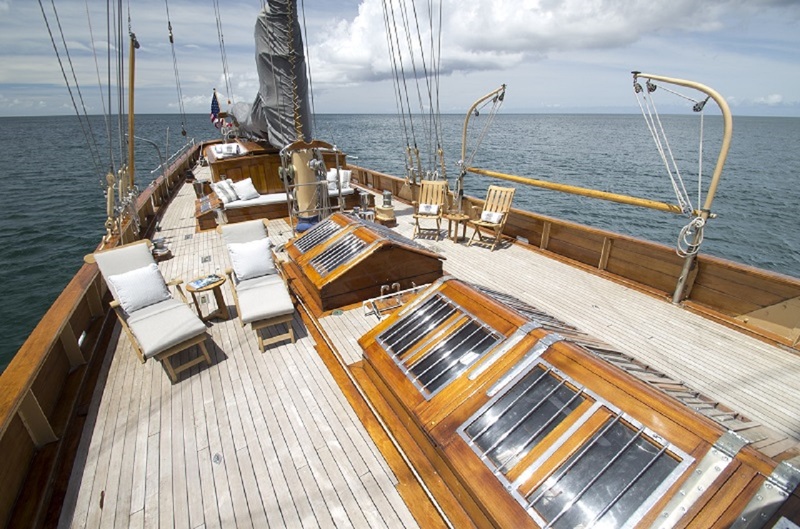 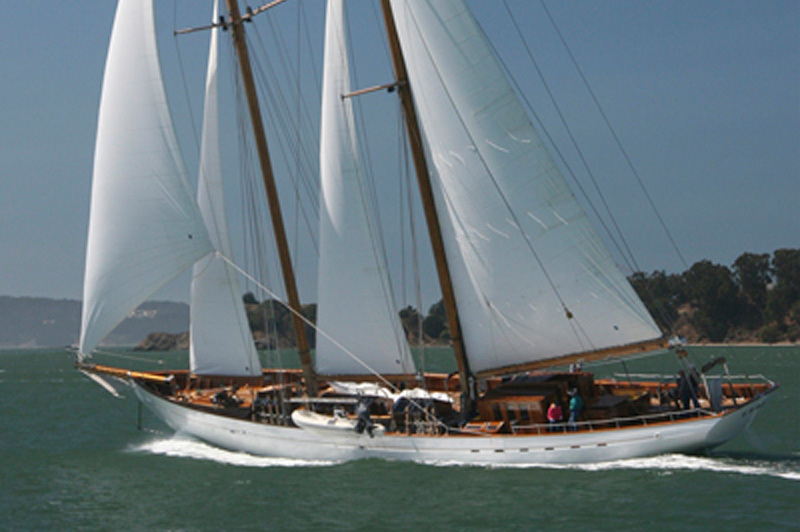 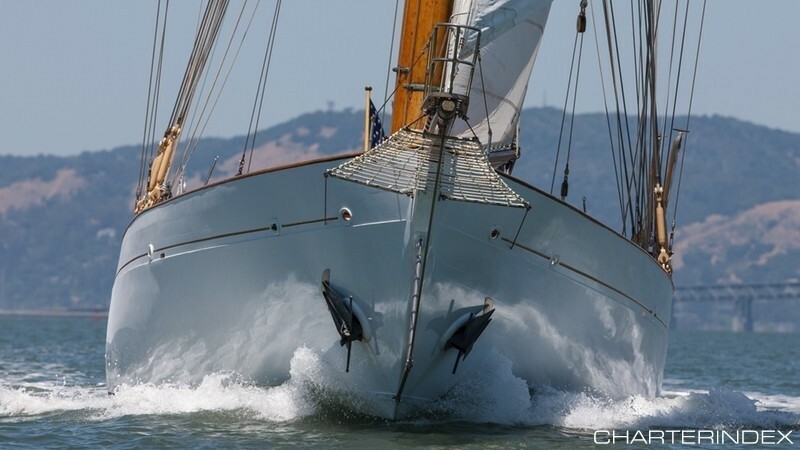 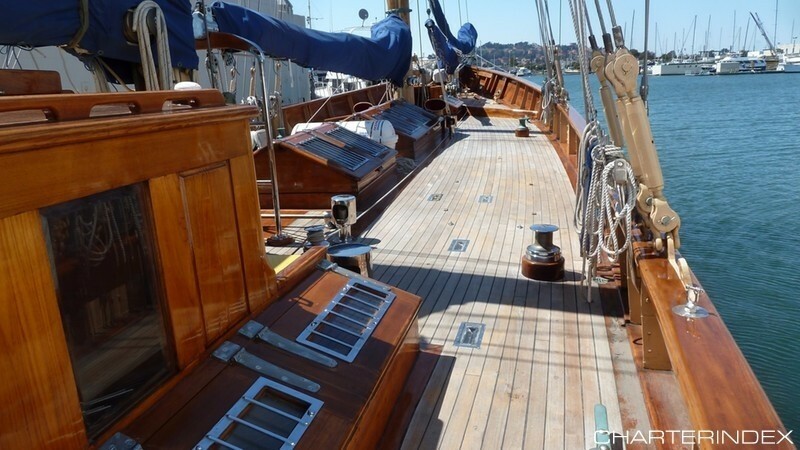 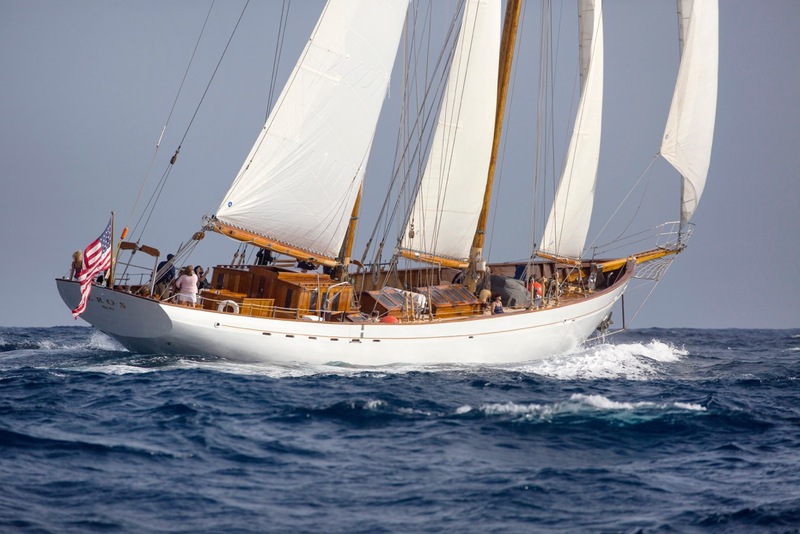 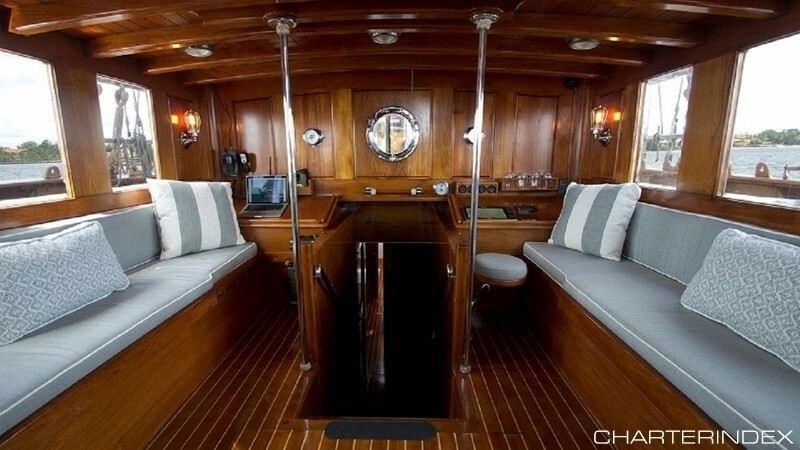 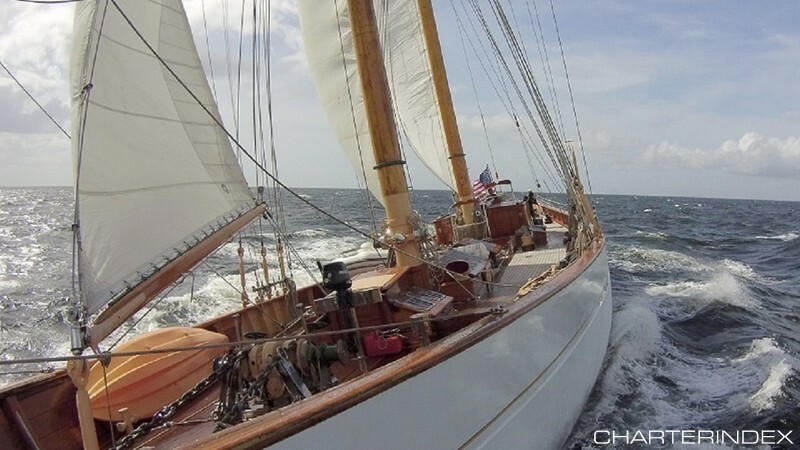 Schooner EROS is a magnificent 1939 Schooner that has been loving restored to her former glory with no expense spared. 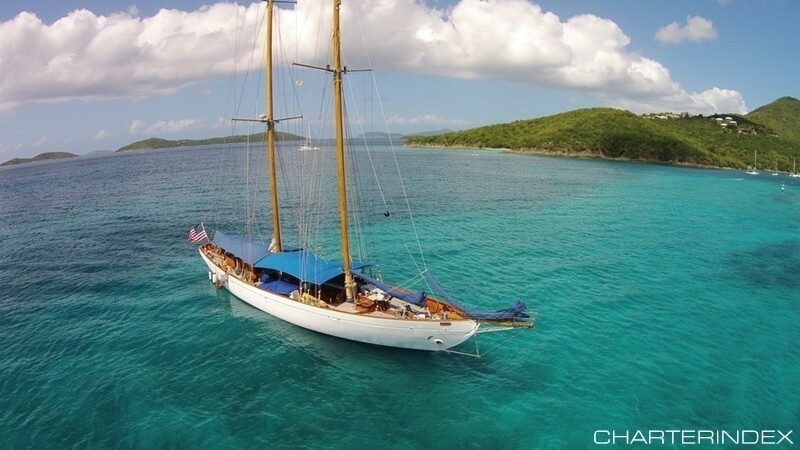 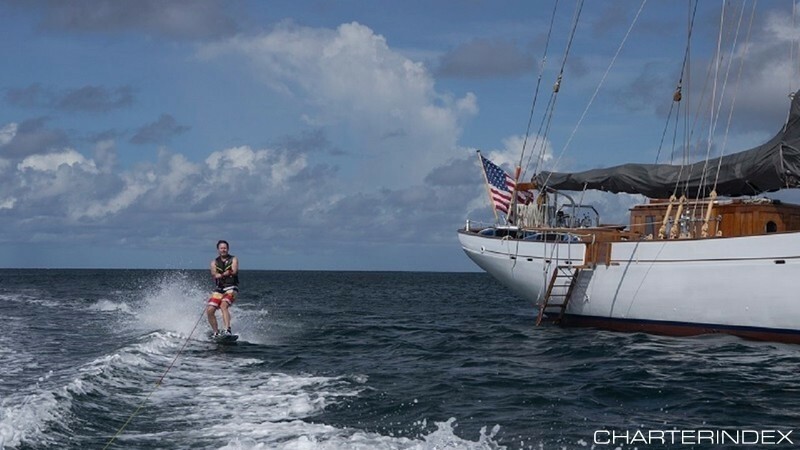 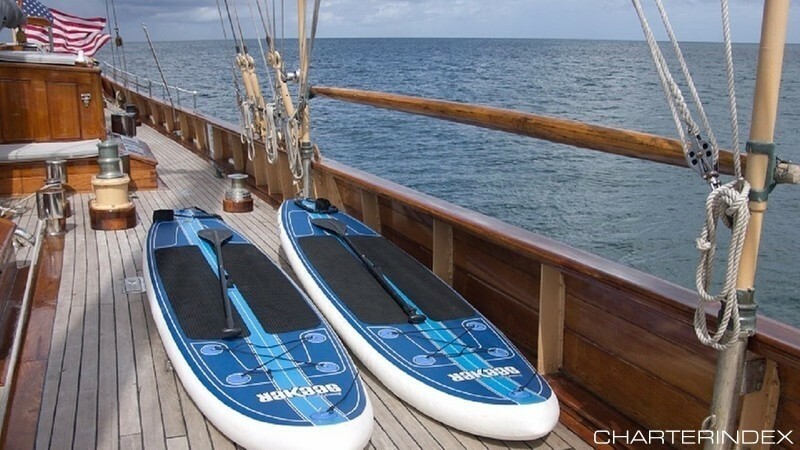 She is available for private charter year round throughout the Caribbean cruising grounds of the Windward islands of the Grenadines, Leeward islands of St. Martin and Antigua, and Virgin Islands. 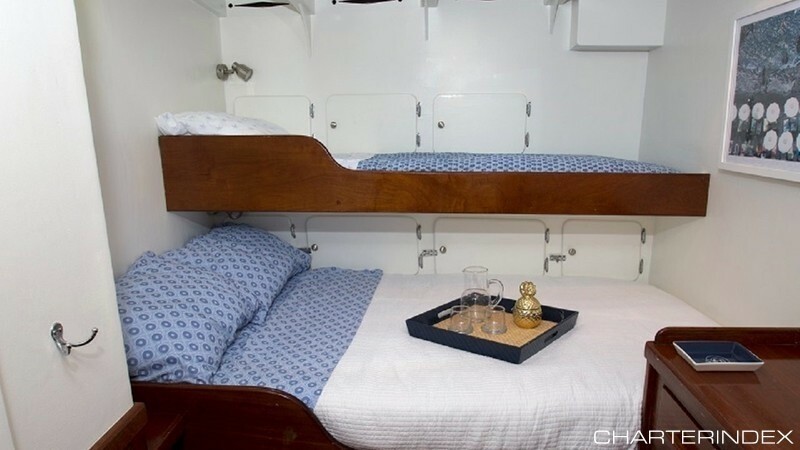 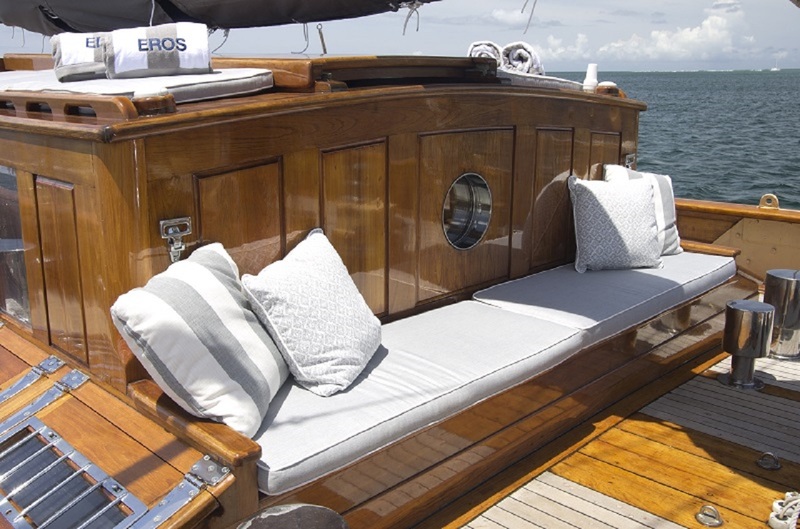 Sailing Yacht EROS offers the elegance and luxury of a bygone era, with all of the comforts and amenities you would expect on a modern cruising yacht. 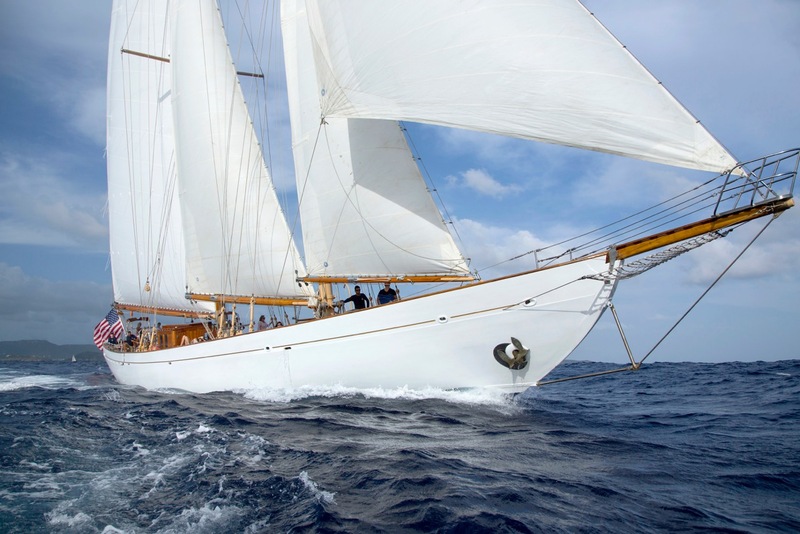 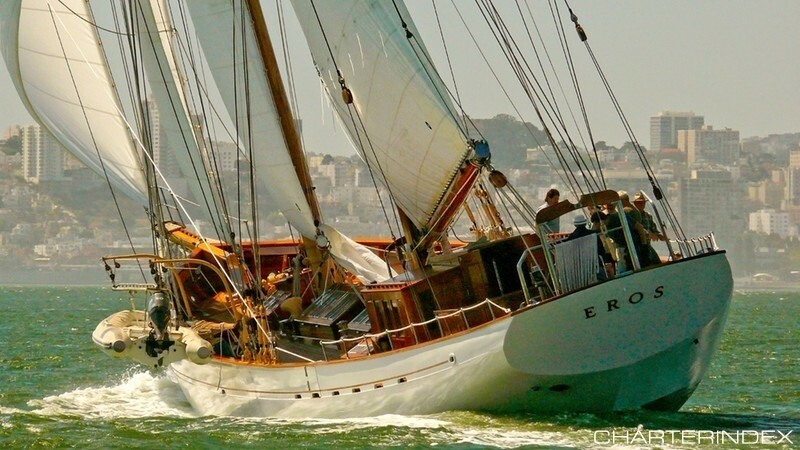 Sailing Yacht EROS has a rich history: built in England in 1939 for the daughter of a British Lord, she was soon commandeered by the Royal Navy for service in the war. 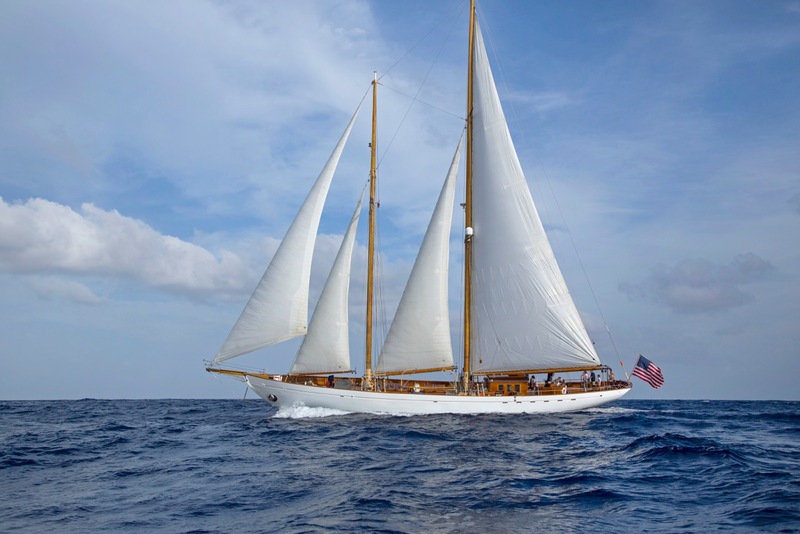 Later, she was purchased by the world’s first billionaire, Stavros Niarchos, and became well know throughout the Mediterranean as his private cruising vessel. 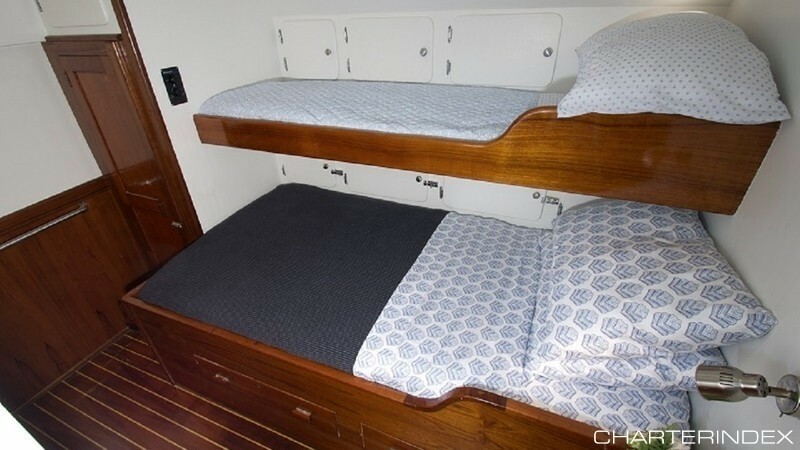 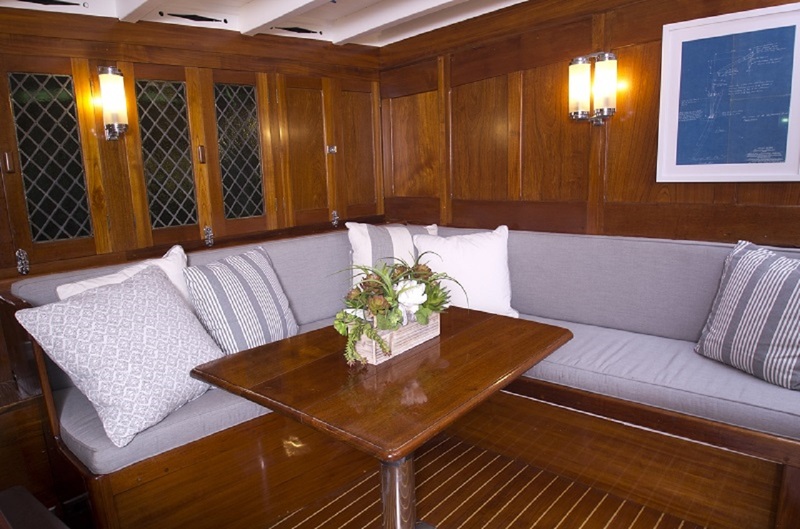 Her current owners have completed an 18-year refurbishment of the yacht, restoring her to her former Art-Deco glory while updating her with the latest electronics, mechanicals and guest amenities. 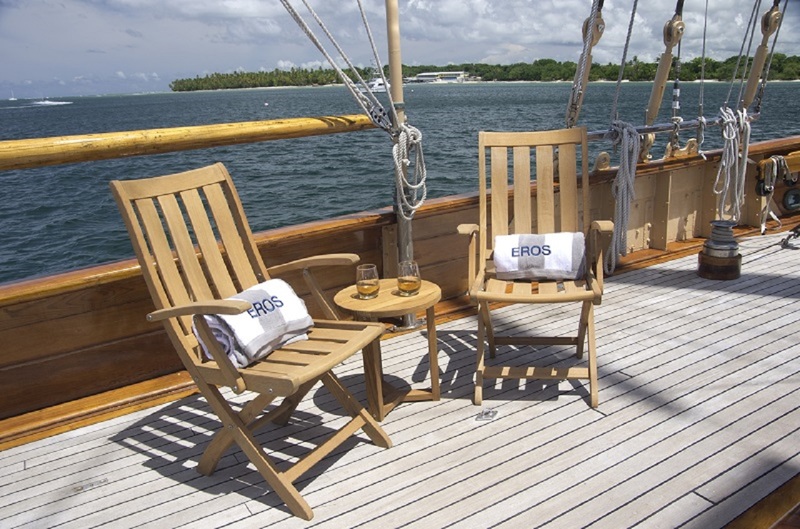 EROS offers a tremendous amount of deck space for sunbathing, relaxing, dining and entertaining. 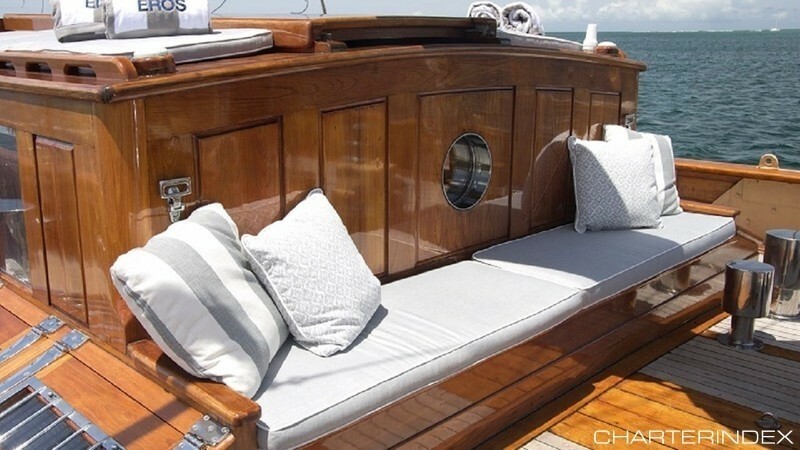 A raised sunbathing areas with fully-upholstered cushions is the perfect place to work on your tan. 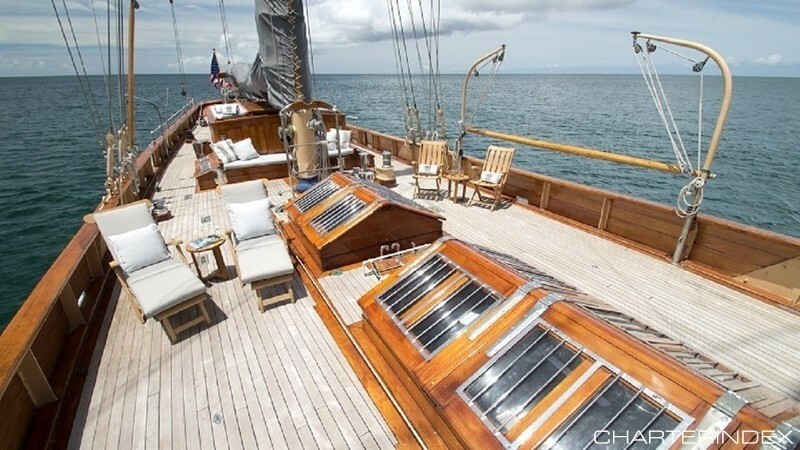 Full sun awnings provide cool options for reading , napping, or just plain enjoying the view. 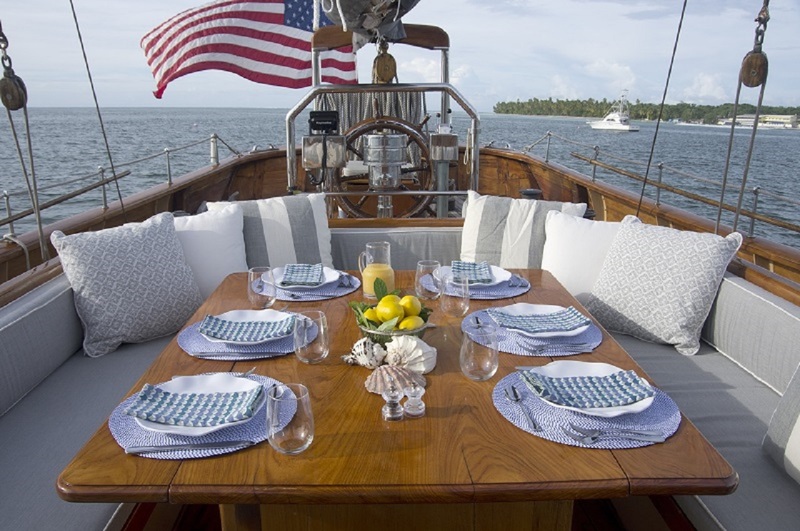 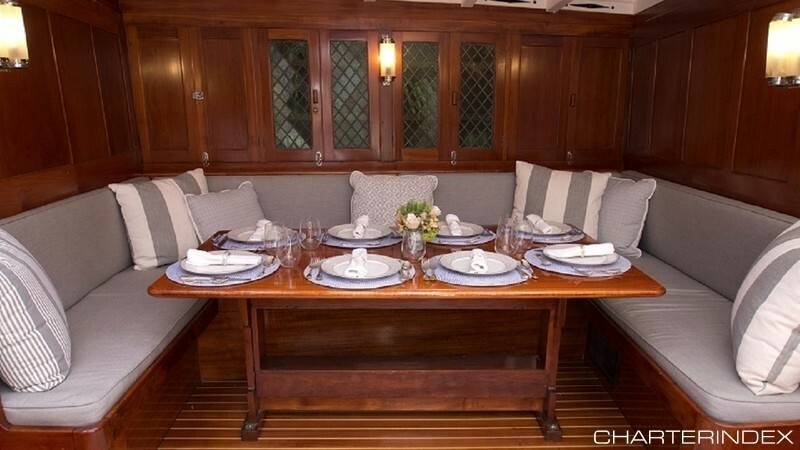 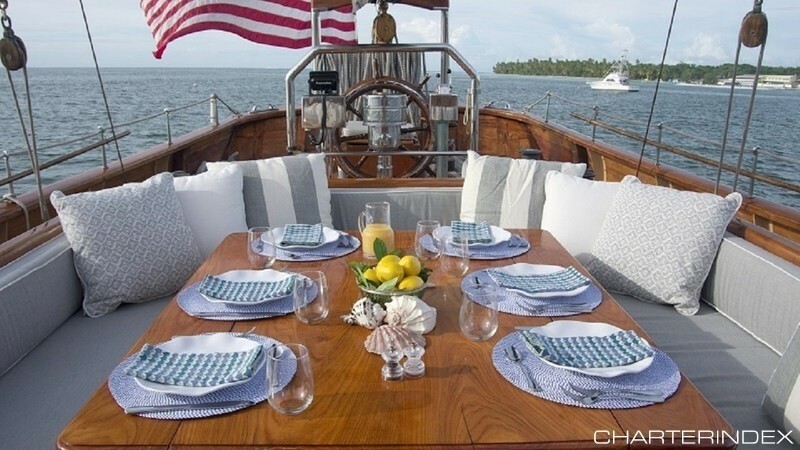 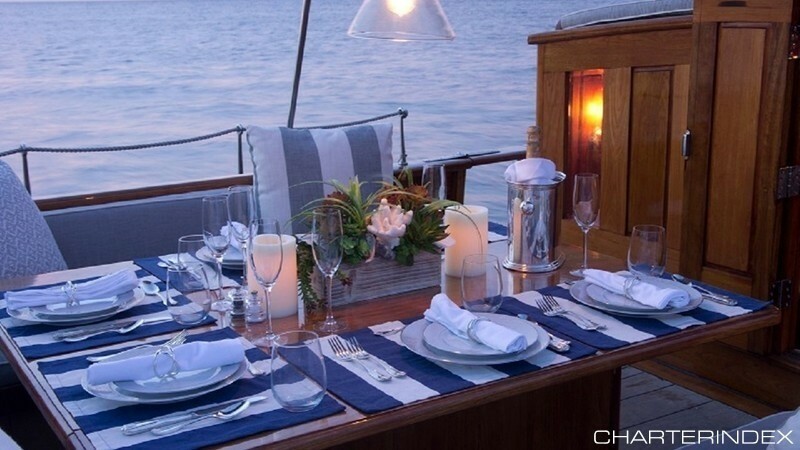 In addition, a wonderful protected cockpit offers a built-in dining table under the stars while the Caribbean breezes keep you cool . 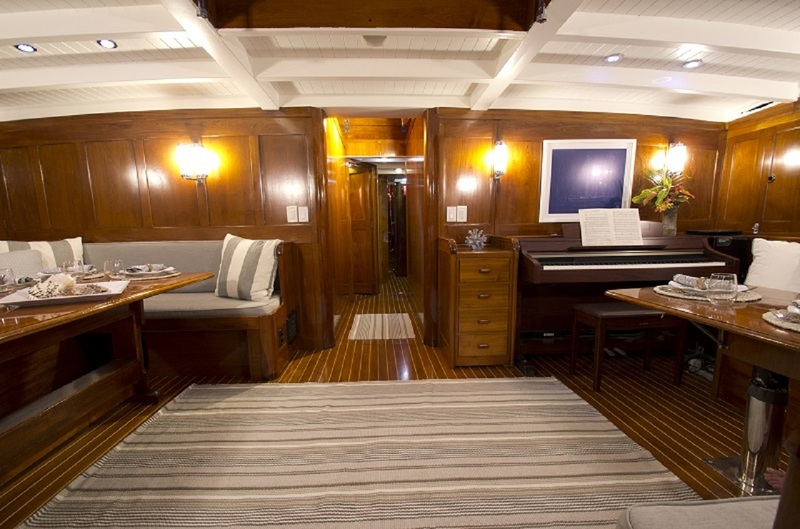 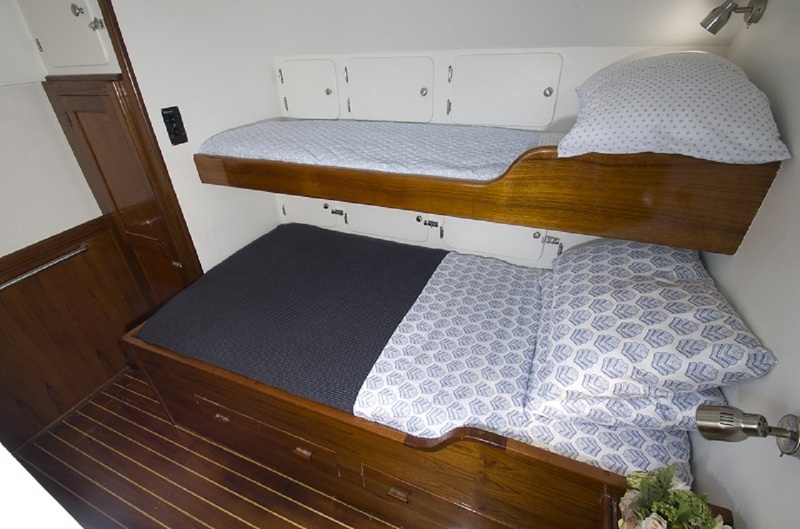 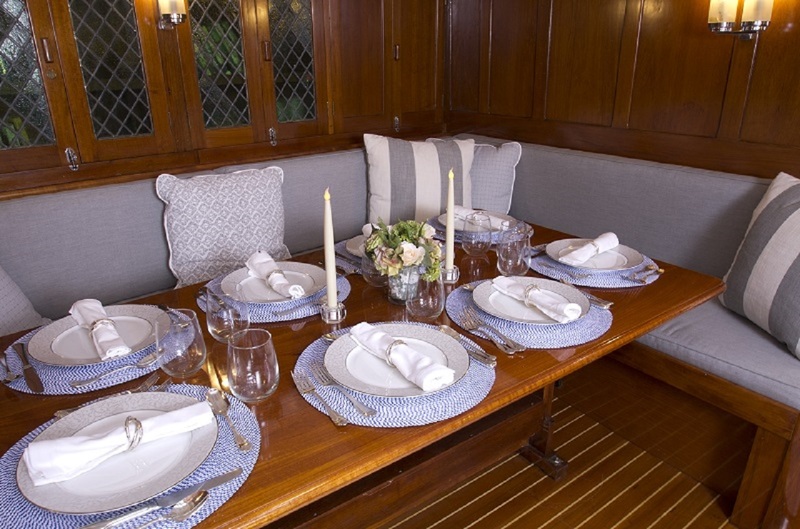 Below decks you are welcomed to sink into her lusciously rich interior, a vision of gleaming varnished teak, classic brass fittings and sofas upholstered in fine burgundy velvet. 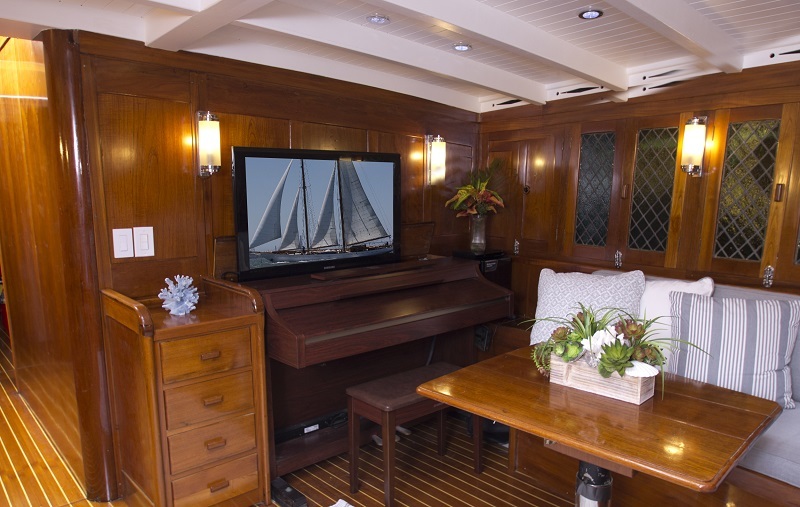 Classic nautical artwork enhances her décor, while air conditioning and a 40” flatscreen TV with Blu-Ray DVD offers modern-day entertainment. 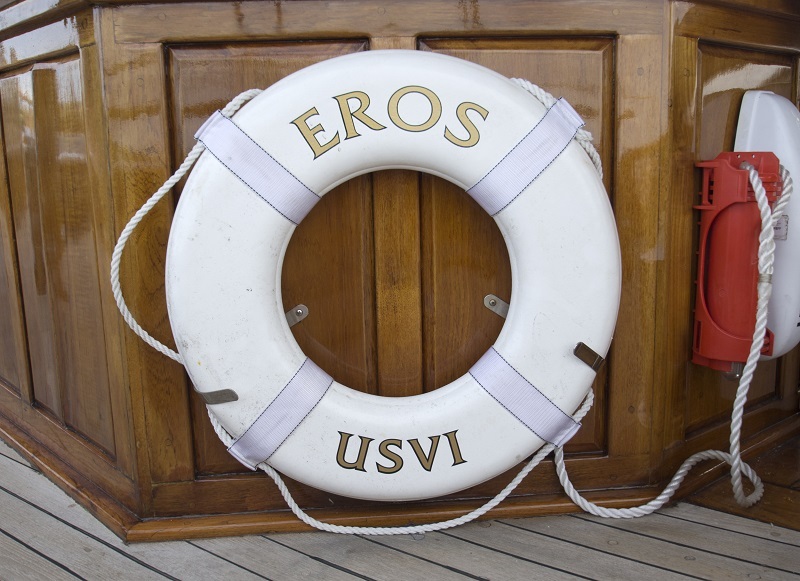 Classic Yacht EROS’ very personable and professional crew of five will care for your every need while onboard this magnificent vessel. 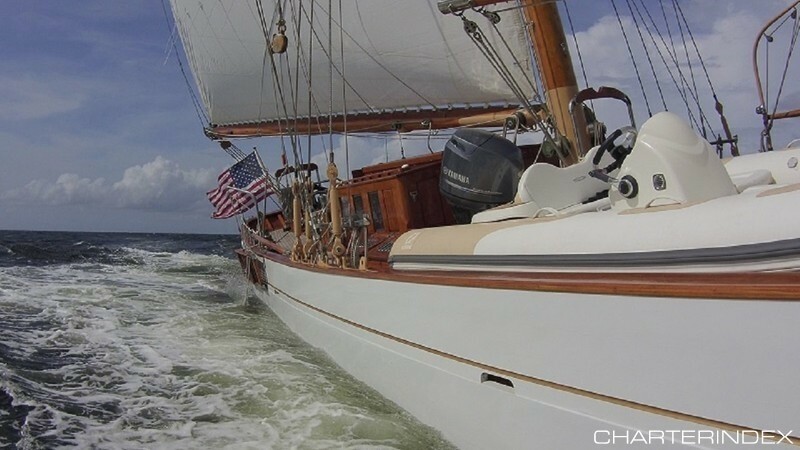 “Captain Bill,” the yacht’s sailing master, is one of the most experienced and well-known sailors in the business, a builder of classic yachts and the man who restored EROS to her former glory. 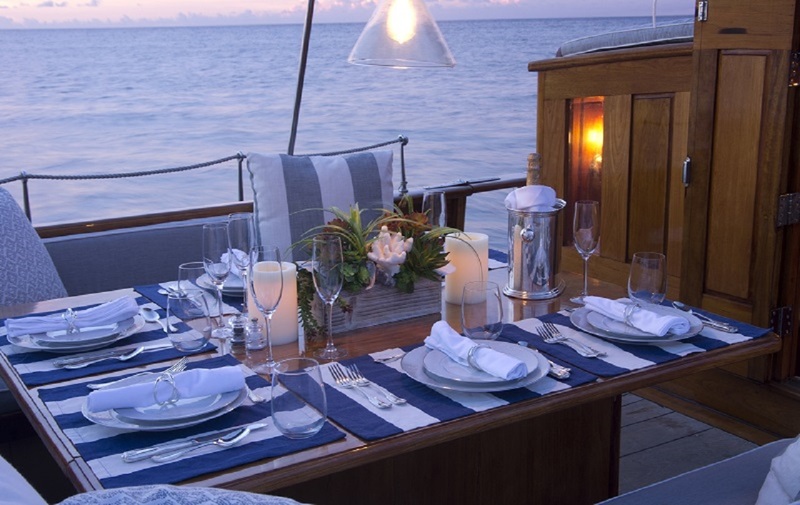 He leads a loyal crew including Captain Grace Bodle, mate/deckhand, stewardess, and of course professional chef Patrick who will indulge you with his culinary delights! 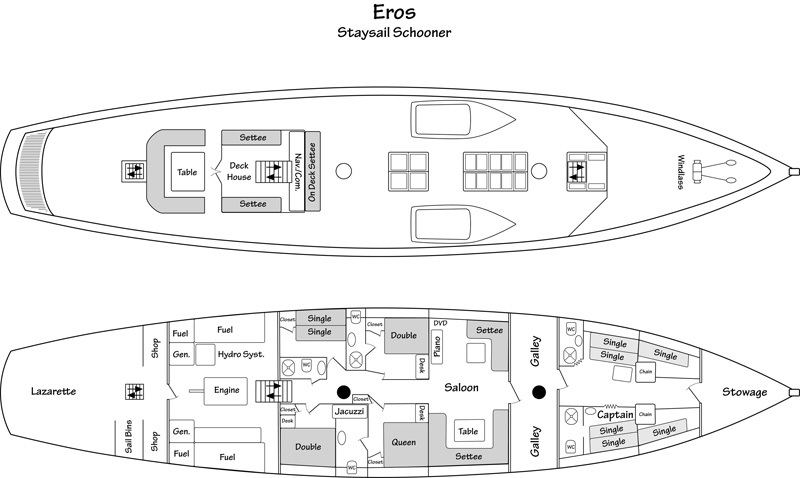 Luxury sailing Yacht EROS elegantly accommodates 8 guests in classic style in one 4 double cabins, two with twin bunk above and a Spa Pool tub in the master. 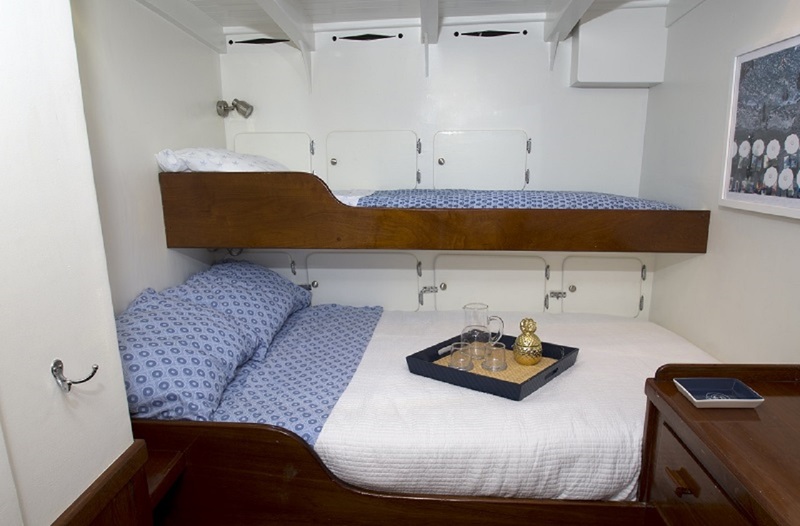 All cabins are fully air conditioned, with the option of large opening ports to allow the fresh Caribbean tradewinds to flow through. 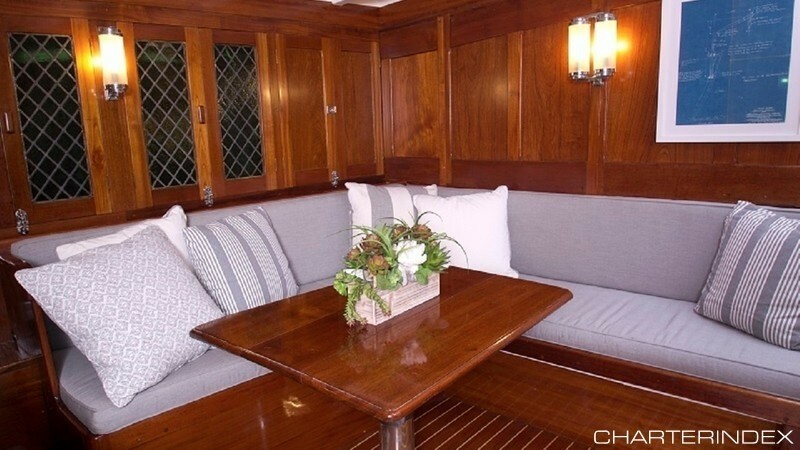 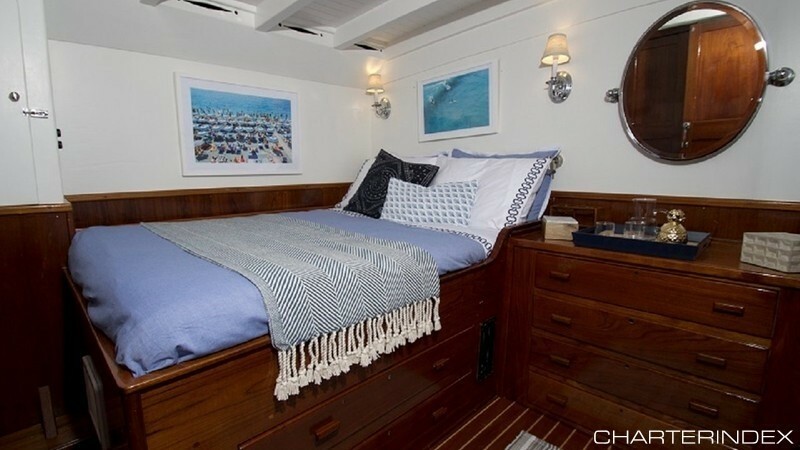 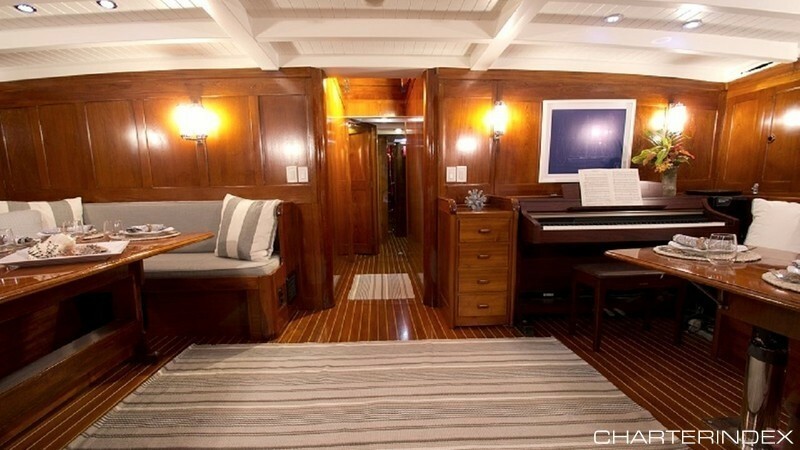 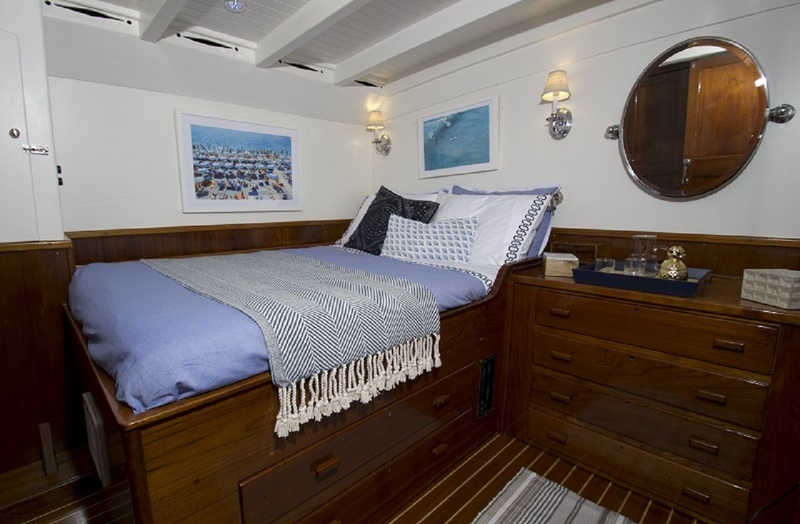 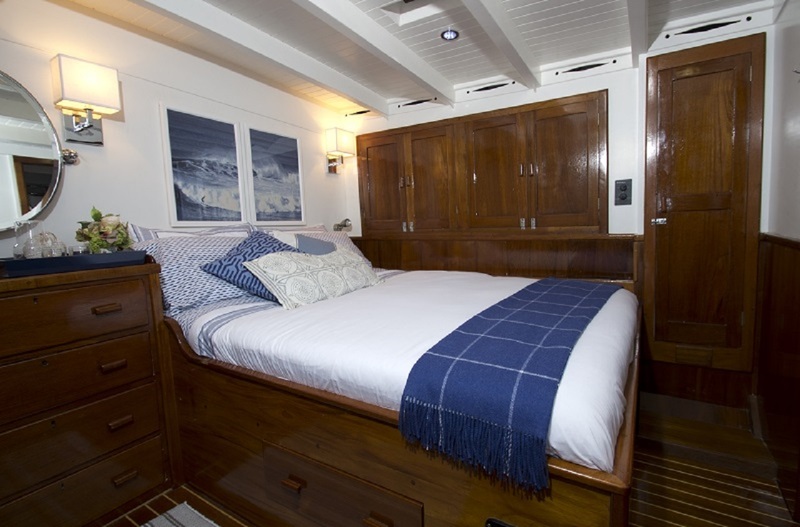 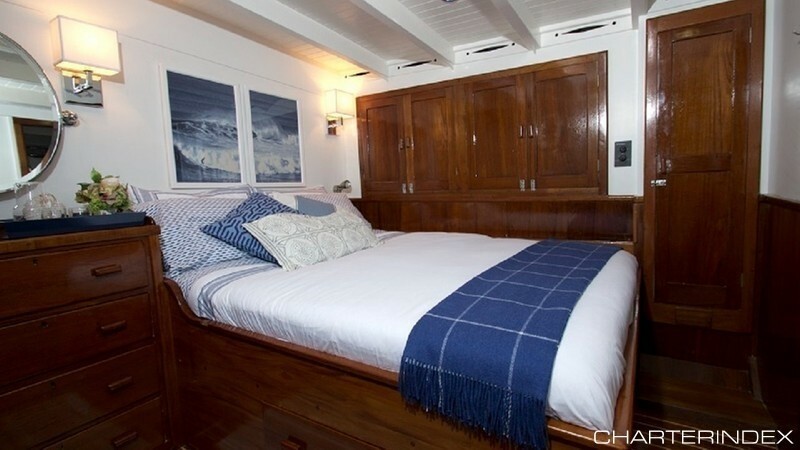 Classic nautical art adorns her warm walls, accented by her beautifully restored and varnished teak paneling. 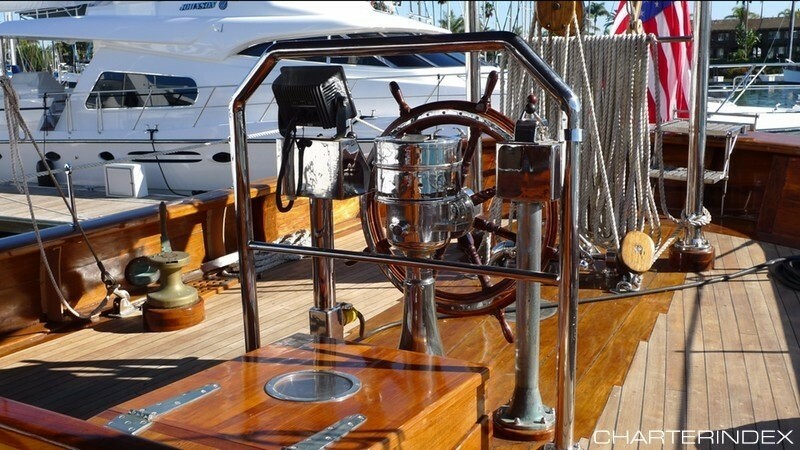 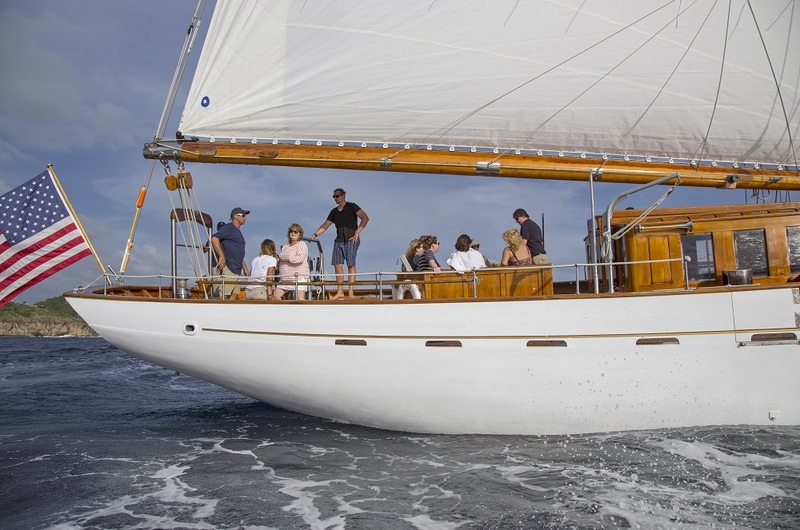 Classic Schooner EROS has been faithfully restored to her original Art-Deco era grandeur, with original varnished teak joinery and brass fittings. 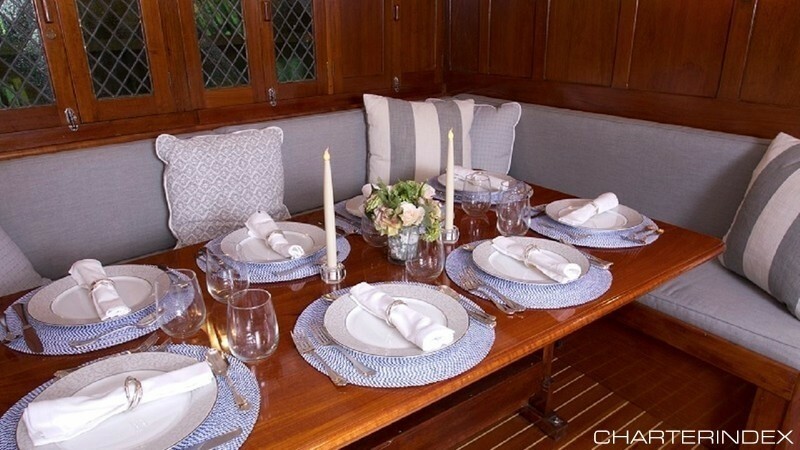 Rich, elegant fabrics create homey and welcoming feeling throughout, and her expansive deck spaces provide plenty of room for sunbathing, relaxing, dining and entertaining . 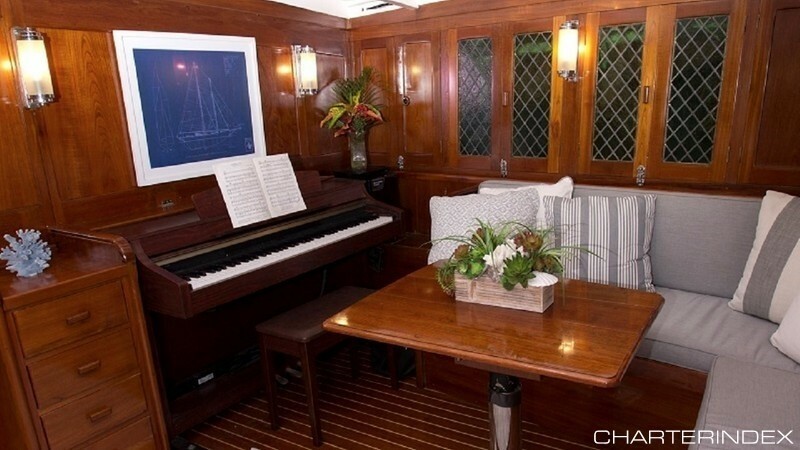 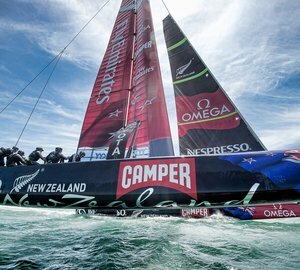 She has been updated to include full air-conditioning throughout, a 40’ flat screen TV with Blu-Ray DVD, Yamaha Piano in the Salon, Satellite phone and data, wi-fi and watermaker for your comfort. 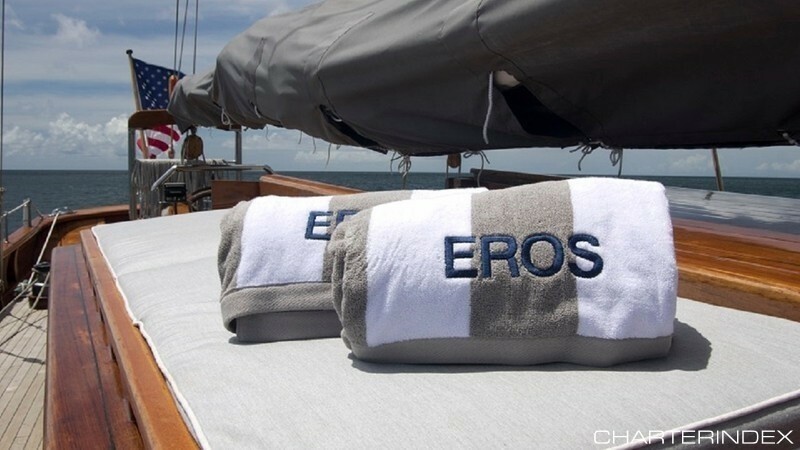 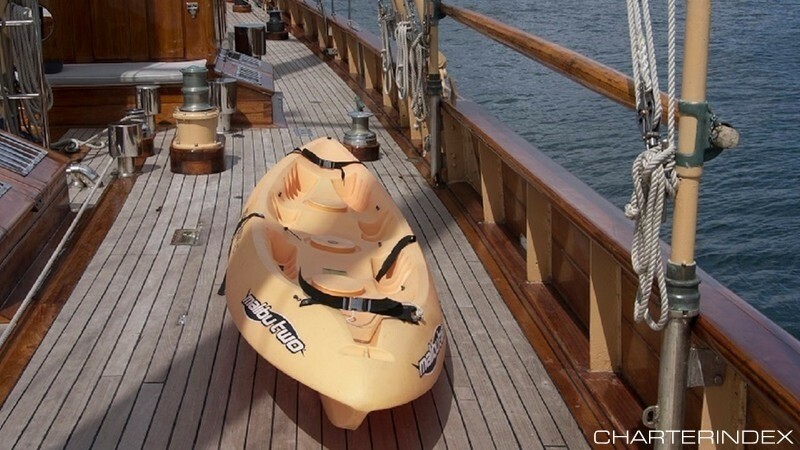 Yacht EROS has a lovely complement of toys including tender with 50 hp outboard, towing tube, Optimist sailboat, towing tube, 2-person kayak and snorkeling and diving equipment.